Deep-drawn bowl sinks have just received a facelift with the introduction of the new Euro-style design from Eagle MHC. These sinks combine the latest advancements in highly functional design with corrosion-free construction to optimize sanitation and efficiency in the industrial workplace or lab settings. 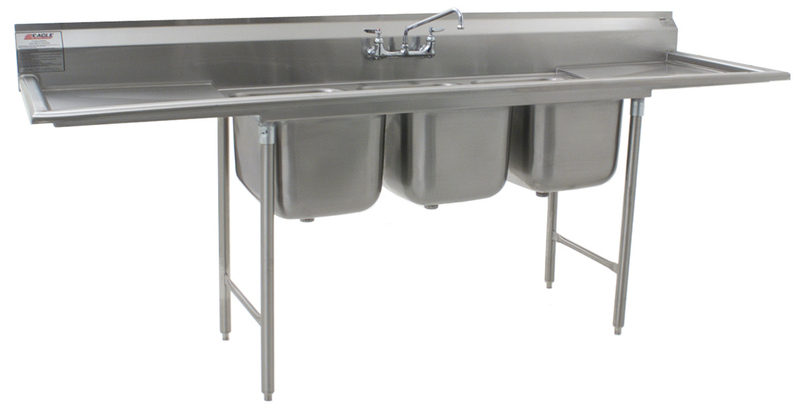 New Euro-style design bowl sinks from Eagle Foodservice Equipment. New Euro-style edging on these sinks makes it easier to keep the surrounding work and floor areas clean, while a new bowl design provides more space and maneuverability for washing compared to competitor’s sink models. Moreover, Eagle MHC’s revolutionary new polishing techniques result in the best, most consistent finish available today. Offered with a choice of one, two, three or four bowl compartments, Eagle MHC’s Euro-style sinks feature heavy-gauge stainless steel construction -- including the bowls, drainboards and backsplash components. All models are approved by the National Sanitation Foundation (NSF). The sink bowls feature a deep-drawn, one-piece seamless construction, along with a swirl-away drainage design for complete evacuation of water. The Euro-style edging prevents spillage and promotes cleanliness of the floor area around the sink, while the drainboard’s die-stamped “crease” design enables faster and more complete water drainage. Eagle MHC’s Euro-style deep-drawn sinks are constructed for rugged durability. This includes front-to-back leg braces for added rigidity and elimination of “wobble.” The leg gussets are welded to a die-cut heavy-gauge reinforcing plate to optimize sturdiness. Most Eagle MHC Euro-design sink models come with a standard 10-inch backsplash element featuring a 1-inch upturn and tile edge for easy installation and “feathering” to any wall-splash surfaces. Other models feature a 2-inch higher backsplash, allowing for a higher faucet clearance as well as 2-inch deeper sink bowls -- thereby providing four inches additional space for washing larger items. In addition to standard product offerings, custom sink configurations are available to meet special layout requirements, including drop-in bowl configurations. Sound deadening is also available. For more details on the complete line of deep-drawn sinks from Eagle MHC including Euro-style designs, contact Lynda Donavon with sales inquiries, or the Marketing Department with inquiries pertaining to marketing support. Tel. 800-637-5100. Or, visit Eagle’s on-line literature library at http://www.eaglegrp.com.